You are here:Home » Promotion / Events » Rexults medSpa Age Resist+ Face Therapy; Red-Carpet Ready! 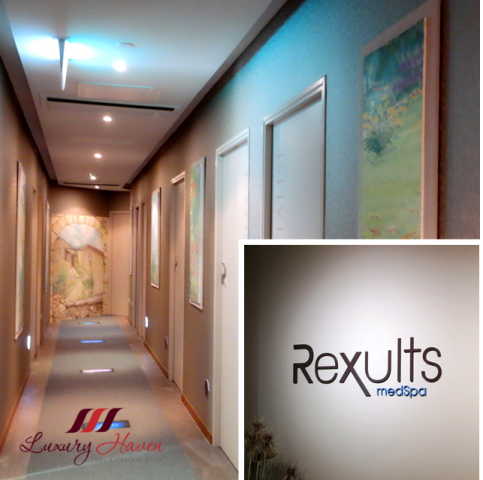 Be ready to be pampered from head to toes at Rexults MedSpa, located at #17-02 Tong Building in Orchard Road. It is no ordinary spa since it is a unique concept by the immaculate and youthful-looking Founder and Director, Mrs Elizabeth Wong. Rexults medSpa is not just about catering to typical beauty needs, but about helping its clients achieve Skin Health and Well-Being by reconciling Advanced Aesthetics and Wellness Diagnostics with holistic approaches. On my recent visit, I was recommended the Age Resist+ face therapy which is an ideal treatment to correct, transform and rejuvenate. It is a must-have non-surgical ‘Muscle Re-Education’ and ‘Face Lifting Solution’. Combining state-of-the-art technology and the skills of the therapist, this therapy is most effective for facial toning and contouring. It is also designed to stimulate collagen and elastin production - resulting in a softer and smoother skin texture. 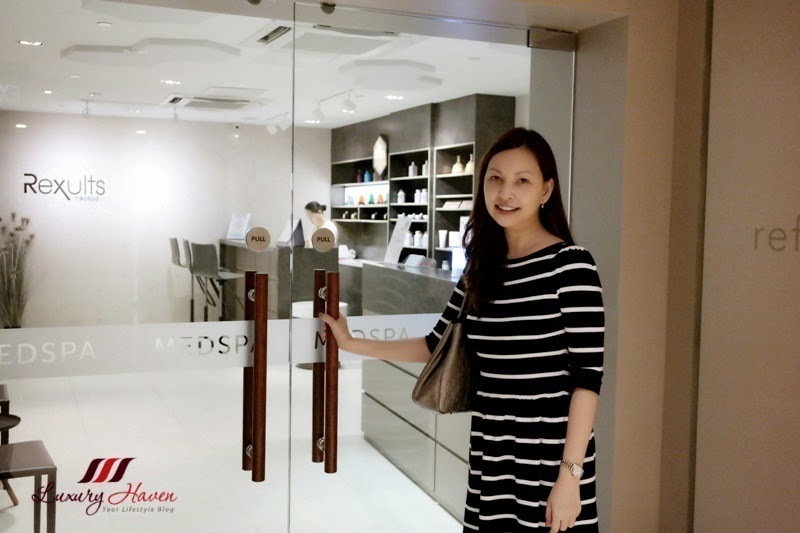 Whilst having the Age Resist+ face therapy ( SGD 380 ), I was able to luxuriate in not only a bespoke High-Tech and Hi-Touch face treatment, but was pleasantly surprised by the perfect accompaniment of the ReBalance Kneads for calves and feet ( SGD 90 ). Combining kneading and circulatory actions, well as stimulating of reflex points on the soles of your feet, the ReBalance Kneads provides a relaxing massage experience. I love how my skin glows after my Age Resist+ face therapy, and how the ReBalance Kneads helps to relieve my aching calves and feet. You can too, improve your Skin Health and Well Being at Rexults MedSpa – the ‘perfect antidote’ to counteract the bad effects of modern city living! Get your Special Price of just SGD 250 instead of the usual SGD 470 for the Age Resist+ and ReBalance Kneads combination therapies now! Valid only for new customers and one-time purchase only from now to 10 July 2015. Appointment / booking is required. Call +65 738-0988, or Email: info@rexultsmedspa.com. Gosh does that ever look gorgeous. I'm SO SO SO into spa things. I need to visit a place like this and get pamper great post. Oh I want a session too. Shirley you are so beautiful and here your skin glow even more. Love the striped dress, btw. You look terrific, girl. The moment I saw the picture of the hall way to the rooms, I'm awe! Your skin really glows! So cool, I need this therapy sweetie. What a good deal for your readers here! Thank you! Sounds like a terrific session! Oh, I need this face therapy!!! Such a lovely place, Shirley, and you look radiant and beautiful! It looks like such a soothing atmosphere, a great place to be pampered. Your face is glowing. Nice. I ve tried this treatment in Italy and it's so good for skin. this age resist face therapy sounds great! ...and I must say you look fantastic in that dress with stripes! I really like stripes, especially in the Spring and the Summer. To me stripes are such a timeless print. anti ageing therapy is must have for me! You look great after! I'm all in favor of non-surgical treatments! Your skin is beautiful, Shirley! This treatment sounds super luxurious and pampering! Lucky you Shirley! great way to be pampered... nice place. Such flawless and radiant skin...!! What a relaxing session! I love it when a facial also offers feet massage too. You skin is glowing, treatment is really worth every penny.